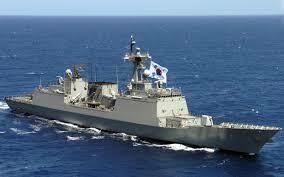 North Korea fired coastal artillery towards a South Korean naval ship off the coast of Yeonpyeong Island. Continuing a trend of provocations that began earlier this year, North Korea fired artillery towards a South Korean patrol boat on Thursday. The patrol boat was not hit and returned fire, but the encounter echoed the much more serious 2010 incident when the North Korean military sank the ROK Navy’s Cheonan, killing 46 sailors. According to the South Korean Defense Ministry, the incident took place off the shore of Yeonpyeong Island, one of South Korea’s northernmost administered islands. Yeonpyeong Island itself was bombarded by North Korea in 2010, killing two South Korean soldiers and two civilians. “A shell fell near our boat at around 6:00 p.m., 14 kilometers southwest of Yeonpyeong Island and south of the Northern Limit Line,” notes one South Korean military official. The shells were fired from the north of the Northern Limit Line (NLL) — the disputed maritime boundary between the two Koreas. The shells made impact 14 kilometers south of Yeonpyeong Island. The South Korean military ordered Yeonpyeong residents to evacuate to shelters as is protocol during these sorts of provocations by the North. The military also ordered fishing boats and other civilian vessels operating in the area to return to port. “We are maintaining readiness against possible additional provocations by the North Korean military, while closely watching its movement,” noted Um Hyo-sik, a spokesperson for South Korea’s Joint Chiefs of Staff (JCS). According to the JCS spokesperson, the incident marks the first time that North Korea has carried out an artillery attack against South Korea using coastal artillery systems. “It is the first time that North Korea has carried out this kind of maritime attack against us. It is not yet certain if it aimed at destroying our vessel or just sending a warning signal,” Um added. The South Korean Defense Ministry has conveyed a warning to North Korea via their mutual military communication hotline. It has conveyed “a stern warning against the shelling provocation and [made it] clear that the North bears all responsibility,” according to Seoul’s defense ministry. The motivation for the attack, as is the case with North Korea provocations, remains opaque. North Korea has been known to coordinate artillery provocations with significant diplomatic and military events in the region, including military exercises.